A user-definable playlist format provides compatibility with most audio players from Winamp through to sophisticated broadcast playback systems, including our own StationPlaylist Studio. 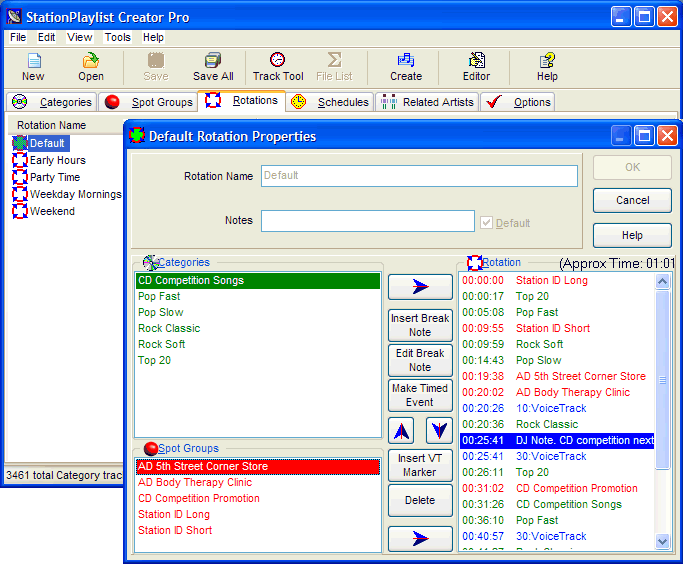 Additional software is included to integrate with the Winamp audio player for a very low-budget automation solution. Playlists are based on hourly rotations of music categories and spots which may be scheduled for any hour of any day. # Song, artist, and title repeat protection. Prevents the same song, or songs by the same artist from repeating within a specified interval. # Generate a personalized interactive HTML playlist for staff or listeners to view upcoming playlists. # No maintenance of song details required. This is a big time saver when adding new tracks. # A sophisticated Playlist Editor to view, edit and print the generated playlist, including search, replace, insert and delete features. Drag and drop supported. # Voice tracking. Record and insert voice tracks in the playlist. This helps your station sound live during automation. # Automatic song intros/outros. Pre-recorded song introductions can be included along with selected songs. This can help your station sound live without voice tracking. # Generate Track Summaries for royalty reporting, and Spot Summaries for advertisement billing. # Integrates with 3rd party traffic/billing software.